Go paperless and save time on every report by gathering data and sketching on your mobile device. TOTAL for Mobile eliminates manual data entry and resketching in the office. Everything syncs seamlessly with your desktop copy of TOTAL, so data flows directly into your report. 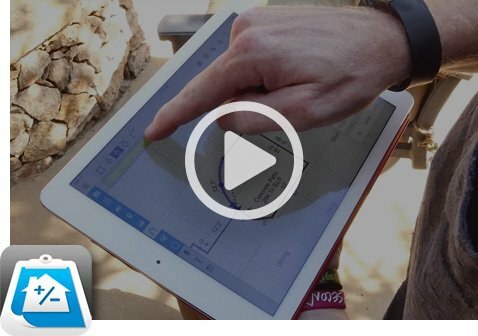 Plus, you’ll reduce the need for return trips by having your digital sketch done on site. Creating detailed sketches is as easy as tapping and swiping with your fingertips. 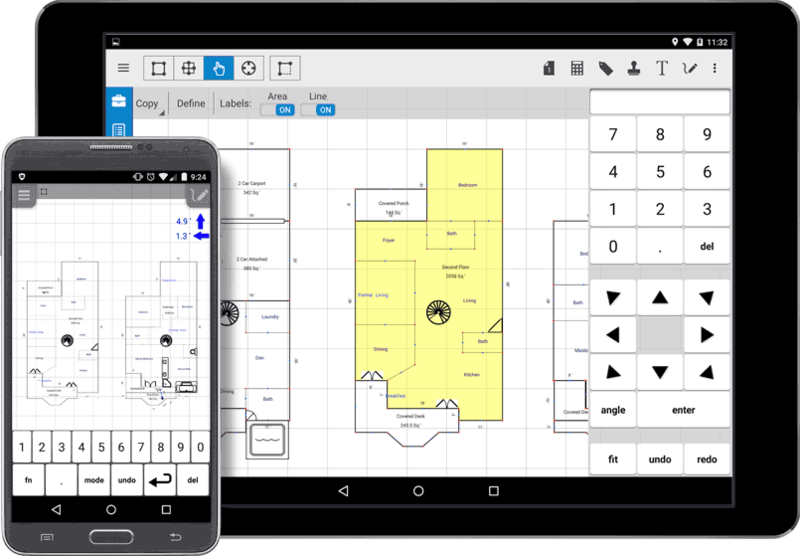 Simply enter your measurements, then swipe and tap to draw exterior and interior walls. Or, if you use a Bluetooth-enabled DISTO, you can send your measurements straight to your phone or tablet. From there, quickly define lengths, angles, arcs, and areas. Then, drop in custom symbols and labels for a completed sketch. You’ll have a completed sketch with correct measurements before ever leaving the property. No more return trips or lost or ruined handwritten sketches. There’s nothing wrong with gathering data in the field, especially if it’s easy. Use canned comments to fly through data gathering in a tap, without all the typing. Have extra notes? Make a quick voice recording, type freeform notes, and create freehand drawings that automatically get added to TOTAL’s digital workfile on your desktop. Plus, TOTAL for Mobile uses your device’s GPS for turn-by-turn directions — extremely helpful for navigating to your subject and comps without having to jump to another app. Speaking of comps, you’re also able to verify and update your comp data, take photos, and even geocode the address on site. Everything about TOTAL for Mobile was designed to save you time. With forms like 1004, 1004 UAD, 1004D, 2055 UAD, Condo, Land, and more right at your fingertips, you’ll be able to dramatically reduce, if not eliminate, the need to enter data twice. When you’re out in the field (especially in the cold), you shouldn’t have to thumb through paperwork or scroll through fields you don’t need. With TOTAL for Mobile’s Critical Items feature, you can pick and choose what fields you want to display on your screen during an inspection. You can even organize and rearrange them to fit your style, making it easier to collect property information. Once your inspection is complete, all your data syncs seamlessly to TOTAL on your desktop. When you’re gathering data at a property, you’re probably used to jotting down details as you go from room to room to type up in your report later. TOTAL for Mobile’s Rooms feature makes it easy to not only enter these room-by-room details, but also eliminates the need to retype your notes when you get back to the office. While completing your sketch, just label the room and double tap the label to access the Rooms feature. From there, you can add notes, details, even photos as you go. Using your device’s camera, take as many subject photos within TOTAL for Mobile as you like, and the pages will be automatically added to your report when you sync to your desktop. It’s especially helpful on FHA, unique properties, and other assignments requiring photos of every room or extensive exterior shots. Simply label the photos (kitchen, master bathroom, etc.) and sync. Easily add descriptions or rearrange photos on the fly. No more juggling extra devices or organizing and relabeling the photos yourself. You have unparalleled freedom when it comes to starting, editing, and sharing your reports between mobile devices and your desktop. 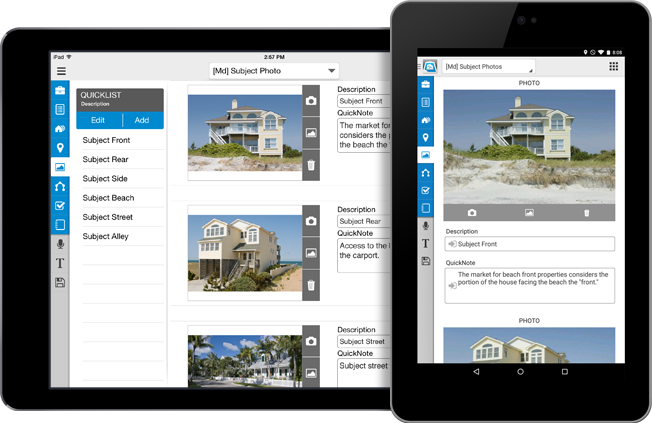 Your office manager can start your report while you’re heading to the property, then you can pull it from the TOTAL cloud to your smartphone or tablet to add data and photos while you’re onsite. Don’t have access to Wi-Fi or a data connection in the field? That’s OK. You can start reports on site or sync your data before you leave the office. There’s no Internet connection needed to collect data and sketch in the app. Simply send the files you need when you get back to the office or a connection area. Put TOTAL for Mobile to work on a few assignments. Once you get the hang of it, you'll shave time off every report. Best of all, it's completely free.